Backed by a modern production process and strong commitment to quality and service, our well equipped laboratory ensures that only the best raw materials are used for our strict production requirements. At ECONAX, we are determined to strike a good balance between technology and the environment. We ensure this by sourcing out eco-friendly materials and using the latest technology to conserve water. All ECONAX branded products comply with Malaysian Standards requirements for product certification, quality standards and manufacturing process. We are certified by SIRIM. 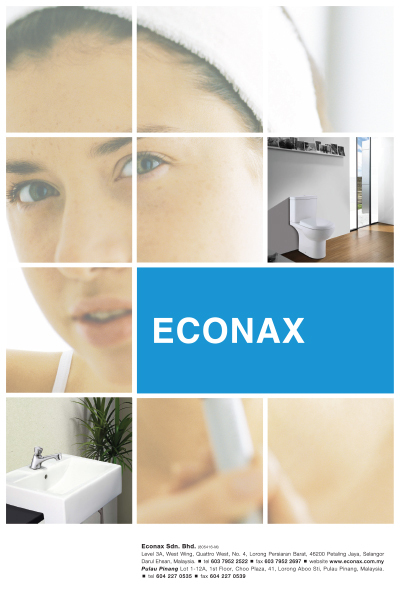 ECONAX is a new name associated with a long established Malaysian company. The brand will remain true to its image and provides a competitive range for the discerning market.